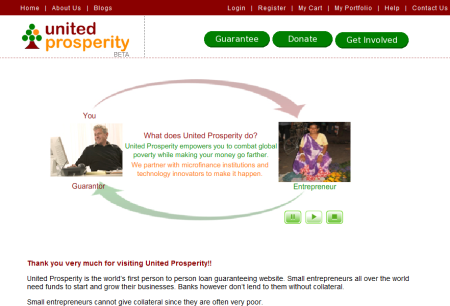 Californian non-profit United Prosperity developed a new twist to social lending – it is a peer to peer guarantee website. Instead of lending money directly and thus needing to transfer it internationally the “social guarantor” provides a cash collateral. This enables the small entrepreneur in the developing country to get a loan from a local bank, which he otherwise would be unable to obtain. Bhalchander Vishwanath, founder and CEO of United Prosperity answered my questions on the new service. P2P-Banking.com: What makes the guarantee model better then other lending models (e.g. Kiva or MyC4)? Maximum impact: Due to United Prosperity’s innovative guarantee model which involves risk sharing with the bank, $1 in guarantee by the social guarantor could lead to $2 to $5 in loan to the borrower thus maximizing their dollar’s impact. Local linkages: Our guarantee facilitates the creation of local linkages between domestic banks, MFIs and poor entrepreneurs. In the course of repaying the loan, both the entrepreneur and the MFIs develop credit histories that will enable them to access more funds at a later date with a lower guarantee percentage, or even without a guarantee. MFIs also get to form relationships with banks and offer other products like savings, insurance, money transfer etc. through the bank. No foreign exchange risk: Since the loans from Bank to MFI and MFI to entrepreneur are in local currency, there is no foreign exchange risk involved. Most of the smaller MFIs do not have forex hedging capability and our model overcomes that. Reduced interest: Our guarantee reduces the interest the bank will charge the MFI since the bank’s risk is lower. Some of the interest benefits get passed on to the borrower. Scalability: There is enough money available in the developing countries. Our guarantee frees up those funds. It utilizes capital available effectively and in the long term it is a more scalable model. Manages risk better: We get the additional benefit of monitoring of the loan by the bank which is not available with other person to person models. P2P-Banking.com: How does “$1 in guarantee by the social guarantor could lead to $2 to $5 in loans” work? What determines the applicable ratio? Bhalchander Vishwanath: The ratio is dependent on several factors. These include the MFI’s or borrower’s prior credit history with the bank or other banks, various banks internal guidelines, their focus on lending to Microfinance institutions and so on. For example for a given MFI we have seen two different banks asking for different guarantee percentages. P2P-Banking.com: Does the Guarantor earn any interest? We see ourselves as a ‘social business’. Nobel Laureate Mohammad Yunus states that a social business is ‘designed to be both self-sustaining and to maximize social returns’. We have only one objective: to combat global poverty. As a result, we do not provide any financial returns or interest to our social guarantors and hope to attract social guarantors who share our objective. P2P-Banking.com: Does the Guarantor actually have to pay money into an account, or does this only occur if the borrower fails to pay back the loan? Bhalchander Vishwanath: The guarantee we offer to banks is a cash secured guarantee. Thus the guarantor has to pay the money upfront. Once the loan is paid back, the money can be withdrawn. P2P-Banking.com: How do you select MFIs? Bhalchander Vishwanath: We screen MFIs who are either recommended by MFI Networks or Banks with whom we have partnerships. Once we get the MFI lead, the MFI has to fill in an elaborate self assessment questionnaire. We evaluate their response, analyze their financials, take necessary references and only then do we sign on the MFI as a partner. P2P-Banking.com: What are typical interest rates MFIs charge borrowers? Bhalchander Vishwanath: We will be first launching in India. In India we see the interest rate to be of the order of 25 % on a declining balance when the MFI lends to the borrower. Bhalchander Vishwanath: In due course we will also be guaranteeing loans to self help groups where the bank lends to the self help group (SHG) directly. There is no MFI involved. With the bank-SHG model, the interest paid by the SHG is of the order of 15%. The SHG could charge a slightly higher interest rate to its members. As we launch in other countries, the typical interest rate could be different. P2P-Banking.com: How do you make money? Optional online Social guarantor fee / donation: Social guarantors who choose to guarantee loans to entrepreneurs can make a small online donation / fee to support our operations. Interest income : We deposit the funds for guarantee with a bank as collateral. We earn interest on these funds and that is a source of income. Guarantee fee : We collect a small fee from microfinance institutions or technology innovators we support. P2P-Banking.com: How are you funded? Are you seeking further funding/investments? Bhalchander Vishwanath: We are supported by pro bono service grants by our supporters. More information about our supporters can be read in the Supporters section. Several people have also have contributed their efforts and expertise on a pro bono basis. For scaling operations, we are seeking further funding / investments. P2P-Banking.com: What is the ‘Beta’ about? Bhalchander Vishwanath: Currently we have built the necessary features to do guarantees. The ‘Beta’ indicates that this is an early version of our website. Our partnerships with banks and Microfinance institutions are getting finalized and once the legal contracts are signed, we will be launching soon. At this point, we are working with HDFC bank in India. Thank you for the interview. The order of the questions has been rearranged before publishing. The questions and answers published above are a selection by me taken from a longer list of questions and answers. Some parts have been slightly shortened by me. Thank you very much for having me!! I look forward to your reader’s inputs and feedback on our model and website.